Covers seams. Stretches with Floor. Color Matched. 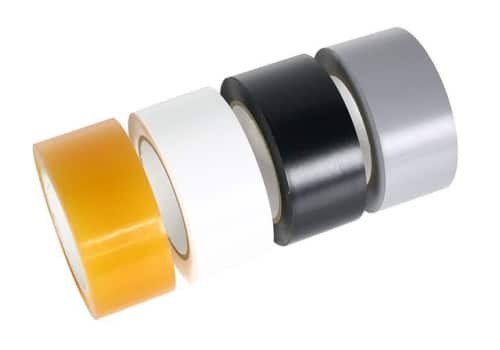 High quality vinyl tape (not the cheap stuff sold on other sites). Size: 2" wide x 108' long. Tape over your dance floor seams with our vinyl dance floor tape to prevent shifting and tripping. Available in: Black, White, Gray, Clear, to match the selected top surface color of your matlay dance floor. Tape over your dance floor seams with our vinyl dance floor tape to prevent shifting and tripping. Once your floor is ready to be laid down, just follow these dance floor taping instructions to complete the last step. Although you can use this vinyl tape to tape down your floor perimeter to the subfloor as well, we highly recommend using gaffer tape instead due to better adhesion with the subflooring. Available in: Black, White, Gray, Clear (looks slightly orange when rolled, but goes on clear), to match the selected top surface color of your matlay dance floor. High quality vinyl tape (not the cheap stuff). Tape colors match our Matlay Dance Flooring.